I'm always on the on the lookout for vintage cookbooks. This caught my eye and I had to buy it. It actually has some great basic recipes! I will scan pages over time and post them here. 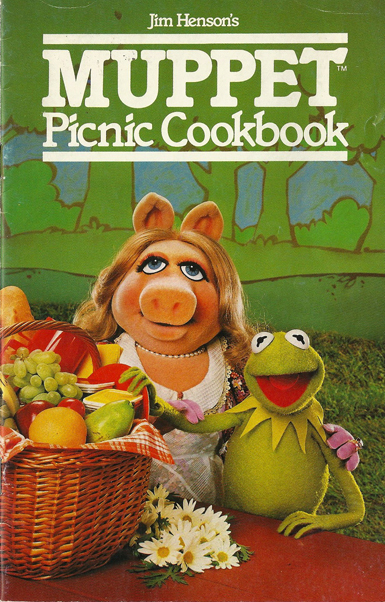 Jim Henson's Muppet Picnic Cookbook is a 14 page stapled booklet published by Hallmark and sold in Hallmark stores in 1981. It includes recipes by Kermit,Miss Piggy, Fozzie, Gonzo, The Swedish Chef and Animal. 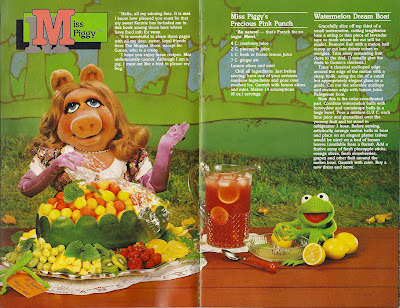 The final layout shows the Muppets eating the picnic, and the back cover shows Beauregard cleaning up after they finish. Among the items seen in the background are "Animal's Crude Oil," "Gonzo's Half-Baked Beans," "Sweetums'Honey," "Bunson's Charcoal Briquets" and "Statler and Waldorf's Salad Vinegar." Gonzo's recipe for Barbecued Ice Cream fails in the book, and The Swedish Chef's Barbecued Filet of Sole calls for two sneakers, but the reader can substitute 2 broiler-fryer chickens. Today's scan is: Miss Piggy's Precious Pink Punch & Watermelon Dream Boat. "Au naturel - that's French for no sugar. Merci"
Chill all ingredients. Just before serving have one of your servants combine ingredients and pour over crushed ice. Garnish with lemon slices and mint. Makes 14 scrumptious (8 oz.) servings.